Northmont Science Olympiad ‘Wright Stuff’ event winners celebrate their awards. 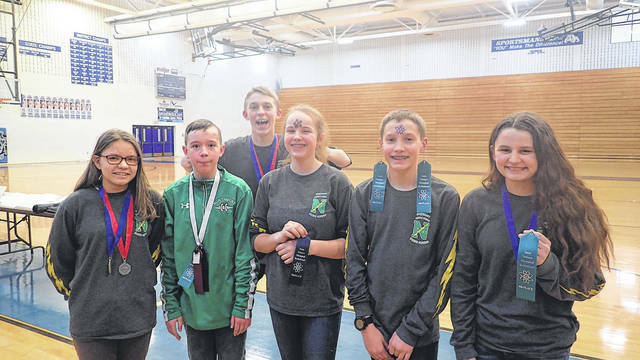 Pictured from left are: Allayna Rose (1st place), Evan Gainey (5th place), Connor Zechar (1st place), Kali Maloney (5th place), Reed Diller (4th place) and Jocelynn Asbra (4th place). IONIA, Mich. — The Northmont Middle School Science Olympiad team, made up of students in the sixth to ninth grades, continues to bring home the hardware; as Northmont won a total of 63 medals and ribbons, and earned the second place trophy at last Saturday’s Ionia High School Invitational, in Ionia, Michigan. Northmont continues to be competitive with other teams within our district and is on pace for possible State qualification, as six teams from the district will qualify for State. Local teams within Northmont’s 22 member district include Centerville’s Magsig, Tower Heights and Watts Middle Schools, Dayton’s Holy Angels and STEM Schools, and Piqua Junior High School. After a back-to-back start to the season, Northmont will now have a few weeks breather to prepare for the next Invitational on Saturday, March 3, at West Liberty – Salem High School. The Northmont Middle School Science Olympiad team is generously supported this year by Applied Mechanical Systems, Greenville Veterans of Foreign Wars, Kindred Funeral Home, MainSource Bank, the Northmont Rotary Club, Ratliff Metal Spinning, Vancon General Contractors and several private local donors. Students interested in science are encouraged to join in the fall, by attending meetings that are held at 7 p.m. every Wednesday and Thursday evening in the Media Center at Northmont Middle School.